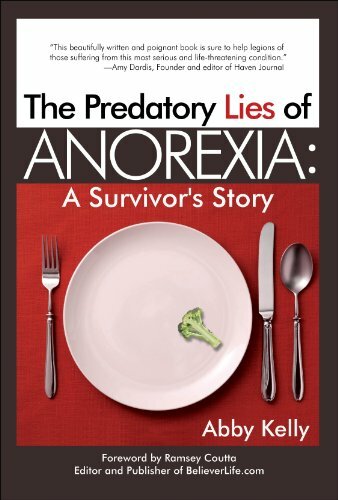 “I want you to think I am the smartest, the thinnest, the most beautiful…” With these words, Abby Kelly encapsulates the overwhelming struggle of her 15-year bout with anorexia—beginning in her teenage years, when the predatory lies of the disease took root in her psyche as she felt pressured from family and peers for not being “enough.” In her quest for a greater sense of personal power, she concludes “I’ll be ‘more’, but it will be on my terms.” Her reasoning is a classic example as to why and how eating disorders dig in and persist as long as they do. From this new self-awareness, Abby targets her body as the agent to show others that she is disciplined and focused. She sets out to restrict her food intake and adheres to a grueling schedule of exercise. While others close to Abby see a person who is dangerously thin, Abby, in fact, derives a sense of personal achievement from her weight loss. Abby exposes the battles, defeats, and ultimate triumph—taking the reader on a poignant odyssey from onset to recovery, including how she set out to fool the many who tried to help her, from dietitians to therapists, from one inpatient treatment center after another, and reveals not only the victim’s suffering, but that of those who love her. This raw and passionate story eloquently describes how Abby finally freed herself from this life-threatening condition, and how others can find courage and hope for recovery, too.